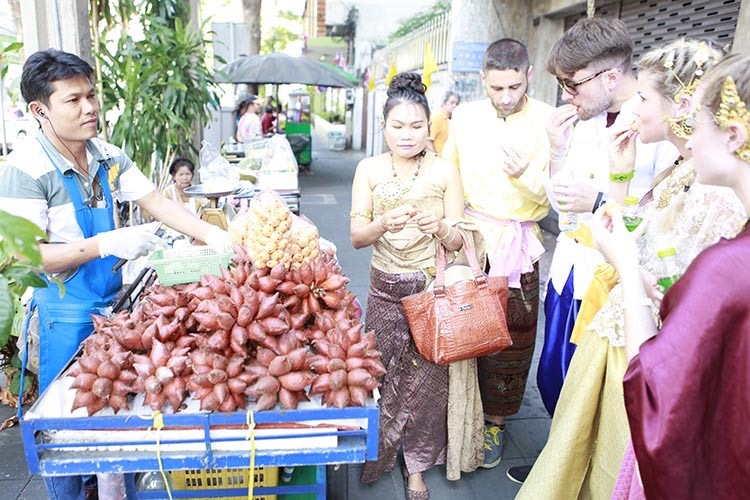 Class includes a market trip as well as a temple visit and brief walking tour of old Bangkok. Students will experience Bangkok streets rarely visited by foreigners. Optionally, a few students in each class will have the opportunity to wear traditional Thai dress. Note: This class is offered by advanced booking only. 2017-18 Promotional Offer: Make one booking, receive a second booking for free. All registered students may bring a friend or family member for free. The class meeting point is the Giant Swing, one of the most famous landmarks in Bangkok. All taxi drivers and hotel staff know the Giant Swing, making your transportation to the meeting point easy. 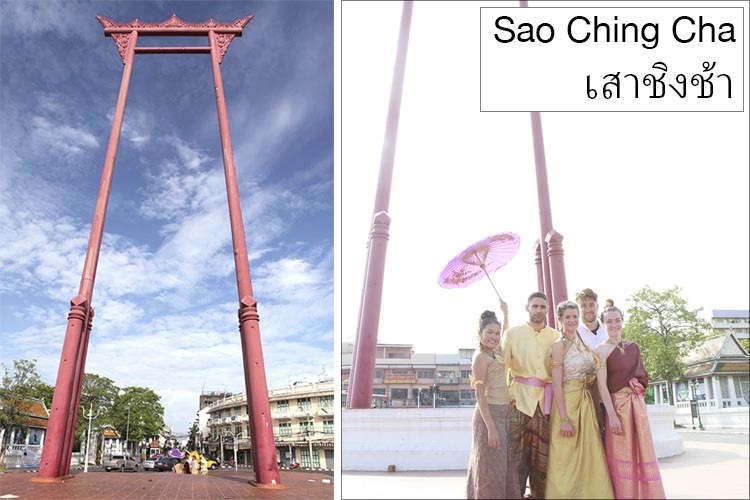 In Thai the Giant Swing is called Sao Ching Cha. You can also show the photo on the right to any local and he or she will know exactly where you want to go. Students are given a brief introduction and have a few minutes to meet each other. Optionally students may wear traditional Thai clothing (available to the first four students who request it). Visit a Buddhist temple important to the local neighborhood, one that is infrequently visited by tourists and dates in close age to the Giant Swing. In contrast to visiting the popular temples alone, during this visit you will see how local residents of this Bangkok neighborhood begin their day at the temple and a practicing Buddhist will provide an explanation of the various activities inside. 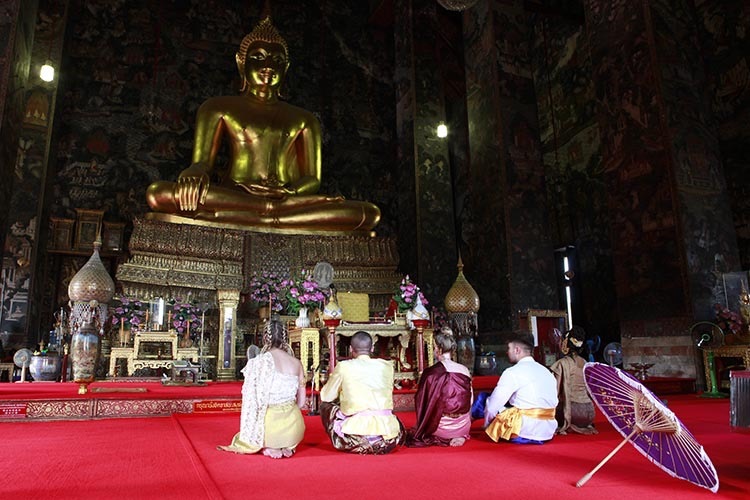 Students are able to visit the temple complex (commonly known as a "Wat") including the center interior where the majority of ceremonies are conducted, and primarily where local visitors spend their time while paying their respects. Once inside the temple you will be able to see monks and staff prepare for the morning ceremonies. The experience is one of the best practical introductions to the daily routines centered around Theravada Buddhism in Thailand. After observing the start to the day, students may sit in a moment of silence or quiet meditation. Afterward, spend a moment taking in the inspiring high ceilings with masterfully painted wall murals depicting Buddhist narratives. The atmosphere sets the perfect tone for starting the day with a tranquil positivity prior to setting out for the market. Students will visit a local market seldom visited by foreigners. The tour of the market will begin with an introduction to a variety of popular Thai fruits and vegetables such as green papaya, mango, pomelo, and lychee, as well as lesser known ones including salak and longan. Students may optionally sample produce that has arrived from farms often less than one day prior to being made available at the market. The market visit continues for another 15 minutes as students are introduced to additional interesting and infrequently seen food ingredients and snacks including sticky rice and banana wrapped in banana leaves, custards, puddings and dried fruit. 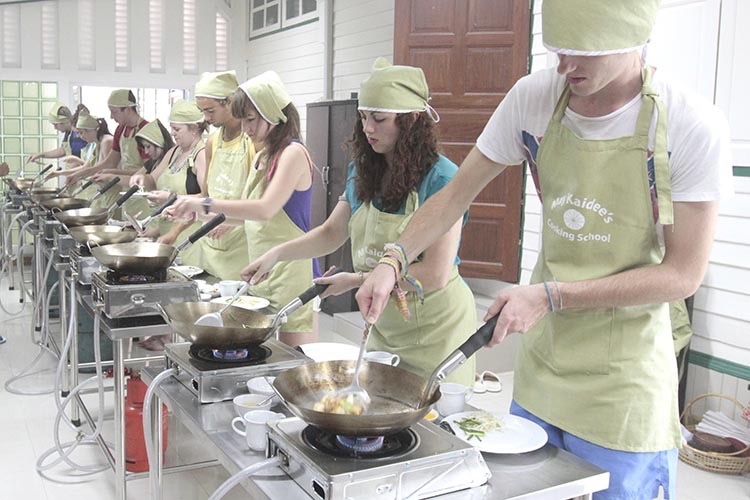 Based on the recipe set from our popular Thai cooking class, students experience hands-on instruction with a full recipe set. 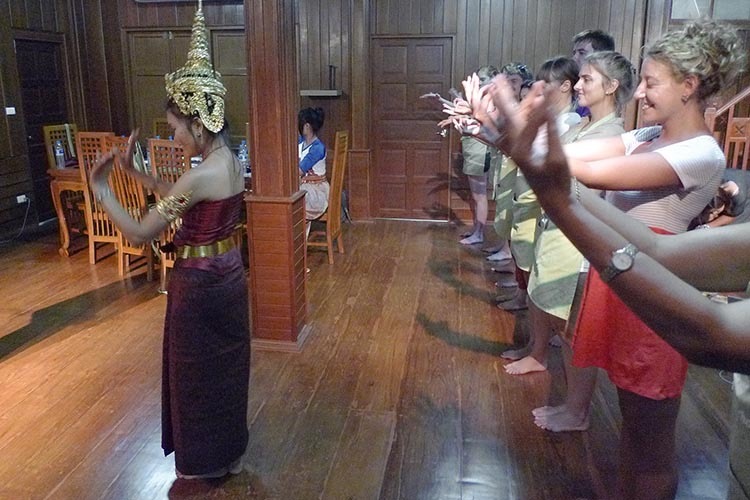 Students are taught the basic steps of traditional Thai dancing, providing an enjoyable closing chapter to the class. The dance instruction is set to music from different provinces in Thailand. Traditional Thai dancing has its roots in dance forms that were refined during the Ayutthaya period from 1350–1767 AD, having been previously influenced by Indian, Mon and Khmer dance styles. The instructor makes closing remarks and can answer any remaining student questions at this time. Students have the opportunity to take group photos at the end of the class.